I can't believe it's been 10 months since the last post. The car has been done since January, I guess we've been having so much fun running it, that I just lost track of time. I was finishing the roll cage during the last installment, so I'll pick up from there. After finishing the cage and tin work around the tubs, it was time to concentrate on the rear end. We had puchased a Competition Engineering fabricated Ford 9 inch housing and had previously welded on the 4 link brackets. I used the 'Big Ford' housing ends and got them from Moser along with a set of 35 spline axles. The axles are probably overkill, but I really only want to do this once. I had gotten the rear disk brake setup from a Mercury Cougar, but decided not to use them. 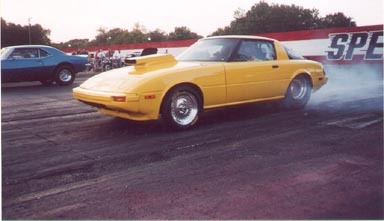 Instead, I bought weld-on caliper mounts from UB Machine and used Camaro front calipers and Olds Toronado rotors. 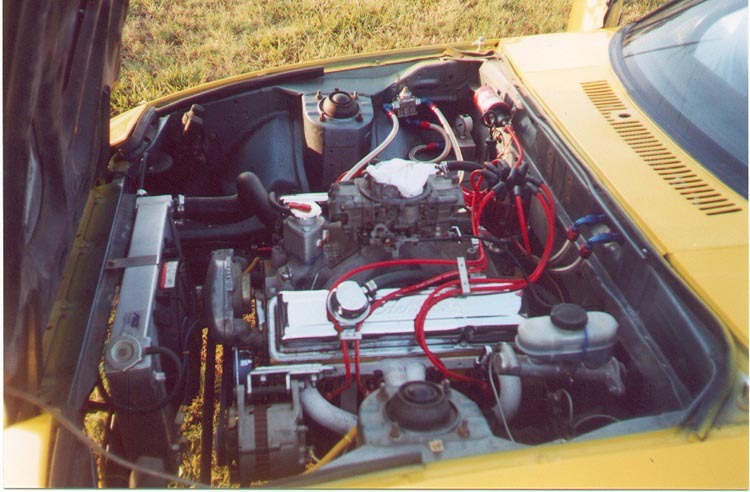 I did use the master cylinder from the Cougar though. In operation, the braking is very smooth with plenty of stopping power. The picture is a little hard to decipher, but shows the left housing end installed, but not yet welded, as well as the tire. The right side housing end isn't installed yet. This was one of the many 'test fits' that need to be done on nearly every part of the car. Lots and lots of measurements before cutting or welding. Once the rear end assembly was finished and the tires installed, the car was able to sit on all four tires for the first time in a year. 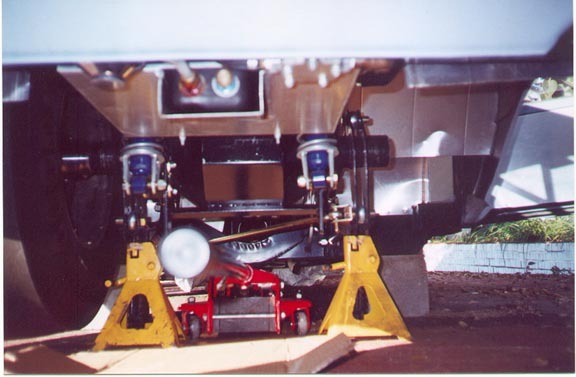 The reason I say "tires installed" is in order to put the rear slicks on, the shocks need to be disconnected and the rear of the car lifted high, to clear the wheel wells, then the car is lowered over the tires. No twenty second Winston Cup pit stops with this car. We shortened a Camaro driveshaft and installed the pinion end of a Lincoln driveshaft and the car was able to move under it's own power, finally! We mounted 23 inch Moroso DS-2 frontrunners on 15 X 3.5 inch Centerline rims and we were ready to go to the track. As the debut approached, I started worrying that maybe the motor wouldn't have the power to turn the big 14 X 32 inch slicks. It would be pretty embarassing to not be able to do a burnout. Well, I was put to ease as it did great burnouts. In the waterbox and on the starting line as well! I had the 4-link set at the center holes of all the brackets, as recommended, but the car sure didn't like it. 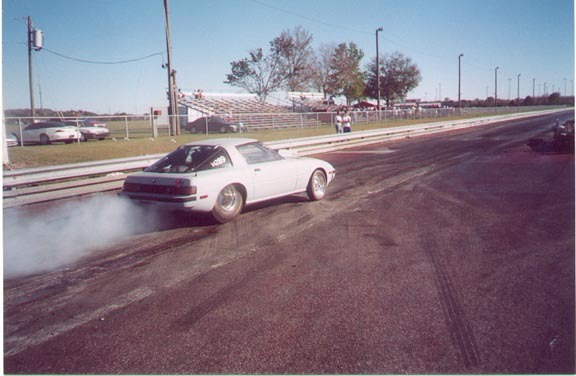 I played around with the preload a little, but only accomplished making the car do donuts in the waterbox. Well almost. Notice all the smoke from one slick and none from the other. The rear end has a spool, so both slicks are turning at the same RPM, but the preload is wrong. There are a lot of adjustments that can be made on a 4-link, and I could have spent lots of time trying different setups, or I could buy a computer program to try them for me. We got the Performance Trends 4-Link Calculator program, entered the measured data from the car, and set it to one of three recommended setups. Instant hook! There is no doubt in my mind that the car would carry the front wheels if we had more motor. Considering the fact that most of the RX-7's weight, which is 2365 lbs., is over the front wheels, I think the 4-link is amazing. Without doing anything to the motor since it was last run over a year ago, we have shaved another 4 tenths off our best ET. That is from the chassis improvements only. It seems almost unbelievable, but we may touch the 11's with a little more fine tuning. And this is from a hydraulic cammed, cast everything, 8.5 to 1 compression motor with unported 1.94 heads! Next, we made it pretty. 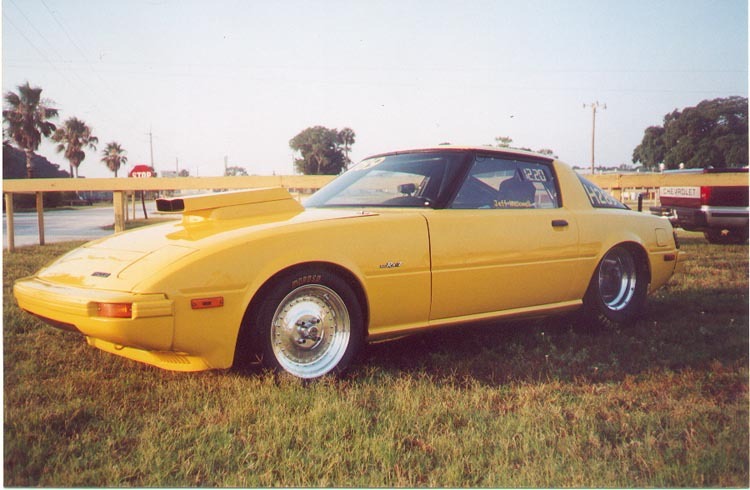 Geoff's master paint and bodywork friends, Troy and Tim did an excellent job spraying the Mazda Sunburst Yellow. Now the car looks good. So far we have about 50 passes on the car and we are still learning something on each pass. Most have been 'Test and Tune' laps, but we have entered three races with mixed results. Geoff has won a few rounds, but we haven't finished in the money yet. The most important thing now is to learn the car. With the huge swings in temperature and humidity between time trials and eliminations here in Florida, it took a while to figure the dial-in, but I think we are getting there. The Test and Tunes help, but track conditions are radically different than a money race. The car has been consistant and we are gathering more data every time we run, so as we get more familiar with how it runs under different conditions, we should be OK. Even when we don't do as well as we would like, just participating is a very enjoyable experience. Think of it as an all-day picnic and get together, and you get to race on top of that. Kind of like a holiday. There are about a million other little things I can think of to ramble on about this whole project, but that is all it would be...rambling. If you would like more details or a question answered, feel free to email us. I check the email everyday and always answer them all. I'll probably post our race results occasionally, especially if we do well. And I'll post any changes, mods or upgrades to the car, but for the most part, the project is about finished. I wasn't sure if I was ever going to be able to say that. Thanks for all the comments, compliments and encouragement along the way. Sincerely, Wayne and Geoff Maxwell.